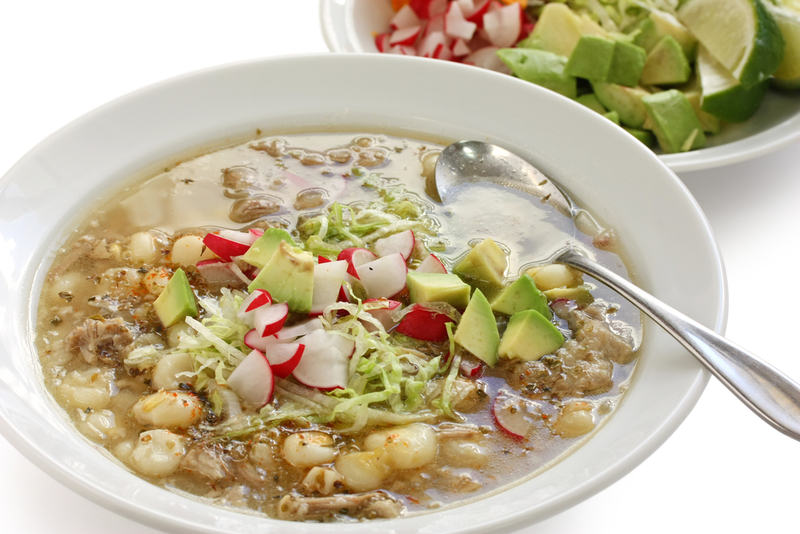 Posole is everything I love about Mexican cuisine. It’s fresh and light, spicy and cool, crunchy and chewy — all in one bowl. Heat a tablespoon of avocado oil in a skillet over medium heat. Add the chicken breast in a single layer and sear for 1 minute on both sides. Turn the heat to low, cover the pan, and cook for 10 minutes. Remove the pan from heat and cook another 10 minutes with the lid still on. Remove the lid, check that the chicken is cooked through, then set aside. While the chicken cooks, bring the chicken broth to a rapid simmer over high heat in a large pot. Once boiling, add the bay leaf, thyme, oregano, garlic, cumin, 1 teaspoon of the salt, chili powder, coriander, smoked paprika, and red pepper flakes. Reduce the heat to low and simmer until the chicken is done. Cut chicken into 1 inch pieces. Add the chicken and the drained hominy to the pot. Raise the heat to medium to warm everything through, about 5 minutes. Taste and add more salt or other seasonings if needed. Remove the bay leaf. Serve the soup in individual bowls with the toppings on the table. Let everyone garnish their soup with whatever toppings they like. Leftover posole will keep for 1 week.